Olive harvest season is finally coming to a close and what better way to celebrate than with your own olive oil tasting party! I just returned from my Olive Harvest Adventure in Umbria, where we picked olives and followed them to the frantoio (mill) to watch them being miraculously turned into our favorite liquid gold. 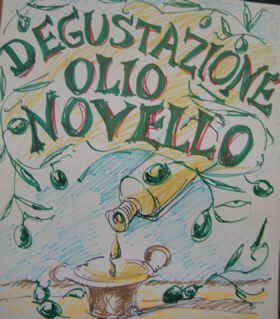 The frantoio in the small village of Petrignano del Lago held a sagra (festival) and our group was invited to taste the olio nuovo (new oil) in the celebrated la prova del pane (the bread test), also known as the fett’unta (oiled slice) ritual. All the neighbors and friends of the community gathered together, bringing their new, freshly-pressed oil and each boasting to have produced the “best” oil of the harvest. Sliced bread was grilled over a fire, rubbed with a clove of garlic, sprinkled with a bit of salt, then the bread was proudly drizzled with the new oil. You may think that this “recipe” sounds like a lot like a basic bruschetta – and you are right. You can replicate this annual La Prova del Pane party or host your own olive oil tasting party any time of the year. Simply invite your friends, include some Italians or Italophiles, and have them each bring a bottle of their favorite Extra Virgin Olive Oil. All that you need to create your own mini-festival is an open fireplace (so that the bread can be grilled on both sides over the embers of a fire), day-old country-style crusty bread, cloves of garlic, salt, and an abundant amount of the best extra virgin olive oil available. Bring out your favorite Chianti Classico or Sangiovese and let the tasting begin! (Of course, if you don’t have the open fire, grill the bread by broiling it in the oven). Raw vegetables are also perfect complements to new oil. Slice some carrots, fennel, cauliflower and celery sticks to dip in the oil. One of my favorites is raw artichokes. Drizzle extra virgin olive oil over paper-thin slices of young, raw artichoke hearts, add a bit of shaved parmesan cheese, and a pinch of salt and you have carpaccio di carciofi. Yummy! If you want to really make it fun, you can ask each guest in your “olive oil community” to bring an appetizer made with the same extra virgin olive oil they brought for the “bread test”. I hope you enjoy the new harvest season and remember, no matter where you live, you can create your own Italian sagra - and don’t be surprised if your Prova del Pane party becomes a favorite annual tradition!